The Japanese way of work is notoriously 'different.' But is it Japan or Britain which is the odd man out? This is the first book to explore the real differences, not by contrasting Japanese employment relations with a hazy ideal image of 'the West,” but through a point-by-point comparison of two Japanese factories with two British ones making similar products. In the first half of the book this comparison is pursued in systematic detail and with vivid illustrations of the attitudes and assumptions which underlie what the author calls the 'market-oriented” system of Britain and the 'organization-oriented' system of Japan. But these descriptions are only the beginning of a broader analysis. 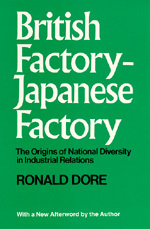 One chapter shows how the employment institutions of the two countries fit into their political, family and educational institutions-an exercise in functionalist sociology without the functionalist's usual claim to be so different-dominates the later chapters and these make a major contribution to the discussion of development and of the 'convergence' of different systems. Are the Japanese being weaned from their 'pre-modern' practices and becoming more like us? On the contrary, Professor Dore finds more signs of our moving in a Japanese direction. The convergence theorists are wrong in taking the market-oriented employment systems created by the peculiarities of nineteenth-century capitalism as necessarily a permanent part of 'modern' industrial relations. This brings the author to the 'late-development' effect. From a wealth of historical evidence, he argues that Japan's organization-oriented system is not simply a manifestation of Japan's unique culture, nor a hang-over from pre-industrial relations. Late-developers can 'get ahead,' adopting patterns of organization which in older industrial countries are still struggling to break through the crust of nineteenth-century institutions. He supports his thesis with evidence from Asia, Africa, and Latin America. If accepted, its importance for policy in these regions is obvious.